As most Finance professionals say valuation is more like an Art rather than Science. There are various valuation methodologies that one could apply in order to determine the value of a company. The main methods are: Discounted Cash Flow (DCF), Comparable Multiples Method (CMM), Comparable Transactions (CT) and Real Options (less common). DCF incorporates the future cash flows of the company, its discount rate (WACC – weighted average capital cost) and the time period of the projections. As an example the valuation of Sanofi-Aventis will be peformed as of 31.12.2005. Country Specific. A special care should be given on the country’s tax law. For example, in some countries, tax losses can be carried forward and therefore the effective tax rate will differ from the common flat rate. Defined as (Property, Plant and Equipment + Intangible Assets) at current period less (Property, Plant and Equipment + Intangible Assets) at previous period. The next step in order to determine the value of the company is the calculation of WACC. This formula shall also exclude restructuring costs and non-recurring items. WACC takes into account the capital structure of the company (i.e. amount of equity and debt) as well as the risk of equity and risk of debt. Where Rf is the risk-free rate which can be estimated from the yield of long-term bonds of the in which the company operates (e.g. U.S. 10-year bond yield ~3%). Where β represents the volatility of the company’s stock price in the capital markets (can be found in financial statements or real-time stock information providers). Often referred as levered beta. Rm – Rf is the equity risk premium (long-term return from the financial markets excess risk-free rate). 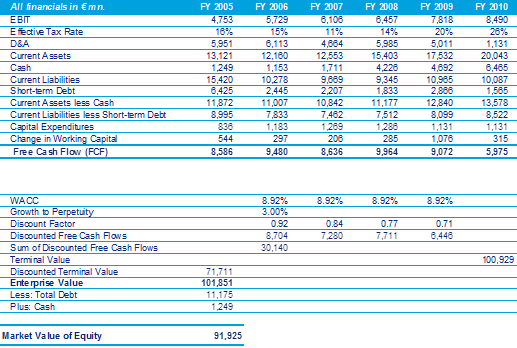 Damodaran provides updated values of equity risk premiums. Cost of debt can be estimated through various ways. A common way is to estimate the default spread of the company and add it to the risk-free rate. For publicly traded companies WACC depends on the capital structure of the company. Cost of debt is in most cases less than the cost of equity because cost of debt is tax deductible. According to the Modigliani–Miller theorem if a company reaches the point of financial distress, cost of debt has a negative effect in the optimal capital structure of the company. As a result WACC increases and the value of the company is reduced. The second part of the equation is called Terminal Value. This is done to compensate for uncertain future returns (i.e. future cash flows cannot be estimated up to infinity). There exist various models for terminal value. The most common model is the stable growth model, as shown in the formula above. This model assumes that the company will grow with a specific growth rate defined as g. It has been suggested that this growth should have two main features: a) It should represent the company’s growth at maturity in its life cycle, b) it should be less than the world’s or country’s GDP growth rate (otherwise the company would be “larger” than the world at infinity). Damodaran has provided a more in-depth analysis of the different types of terminal values. In this example the value of Sanofi-Aventis will be estimated as of 31.12.2005 and will be compared to the market capitalisation of the company at the same period. This is done because it is highly difficult to perform a current DCF, since there are various parameters that cannot be accurately determined (e.g. future sales, future investments, restructurings etc.). However, an interesting conclusion that can be drawn from this analysis is whether the market was overvaluing or undervaluing the shares of the company at that time. In addition, if this methodology is performed in a large sample of pharmaceutical companies a historical overview of how the market valued the stock of pharmaceutical firms in the past can be obtained. A growth to perpetuity of 3% was assumed. In addition, it has been assumed that CAPEX will be equal to D&A in perpetuity (therefore free cash flow formula used in terminal value will be lower than previous years if in previous years D&A was higher than CAPEX). This is because at perpetuity growth CAPEX shifts to replacement CAPEX, meaning that the Company tries to offset the effect D&A rather than introducing new capital investments. In addition, at Terminal Value FCFF was actually calculated rather than assuming last years FCFF and applying the growth to perpetuity in order to apply the previous adjustment (D&A = CAPEX). The market value of equity using DCF was estimated at € 91,925 mn. based on the analysis above. The market capitalisation of Sanofi-Aventis as of 31.12.2005 was € 103,656 mn. There exist two potential explanations for the variation between intrinsic (DCF) value and the actual market capitalisation of Sanofi. Firstly, the market does not have the information that already exists (as this is a historical valuation). For example, an acquisition would increase CAPEX (which reduces FCFF in the short term) but in the longer term it would cause EBIT to rise and potentially result in a share price increase. However, the reason the 2005 – 2010 period was selected is that it is after the merger between Sanofi and Aventis in early 2004 and before the Sanofi – Genzyme acquisition, to avoid any distortions caused by the latter transaction. Secondly, historical DCF valuation uses a specific time range (of up to 5 years + terminal value for mature companies, while 8-10 years + terminal value for start-ups) based on actual FCFF values while the share price is based on investors’ expectations which are occasionallyshort-term. Moreover, small changes in WACC and growth to perpetuity can have a major effect on the overall market value of equity estimation. Finally, considering the sensitivity of the model on such effects, it can be said that overall, the intrinsic value of Sanofi agrees with that of the market. This means that investor’s expectations were realistic at that time as they were aligned with the actual performance of Sanofi-Aventis. Within the next week the Valuation of Pharmaceutical and Biotechnology Companies: Comparable Multiples Method (Part 2) will be published which will be compared with the results of the DCF approach.